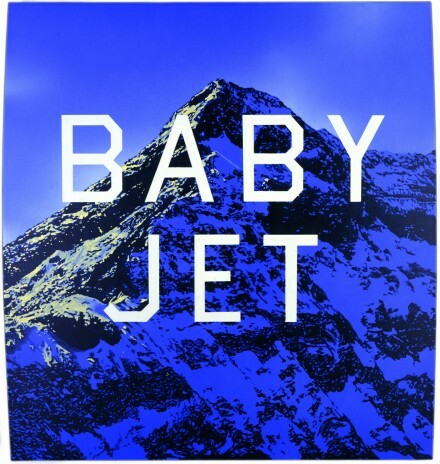 Ed Ruscha, Baby Jet, 1998. Photo by Paul Ruscha, courtesy of Moderna Museet. Currently on view at Moderna Museet in Stockholm, Sweden, through September 5, is Ed Ruscha: Fifty Years of Painting. This exhibition, which is a collaboration with Hayward Gallery in London, shows more than 70 paintings. It spans the period from 1958, five years prior to his debut in 1963 at the legendary Ferus Gallery in Los Angeles, to the present day. Curated by Lars Nittve and Ann-Sofi Noring, the installation groups Ruscha’s works in chronological order so as to allow the viewer to see the development of the artist’s various motifs and styles over time. 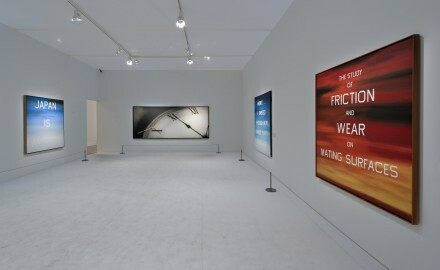 Installation shot, Ed Ruscha: Fifty Years Of Painting. 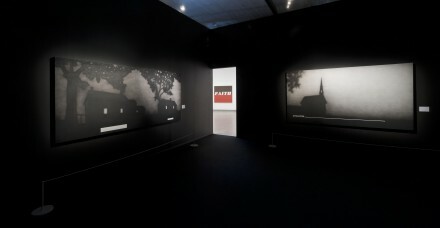 Photo by Åsa Lundén, courtesy of Moderna Museet. Ed Ruscha, Echo Park Studio Los Angeles, California 1963. Photo by Joe Goode, courtesy of Moderna Museet. 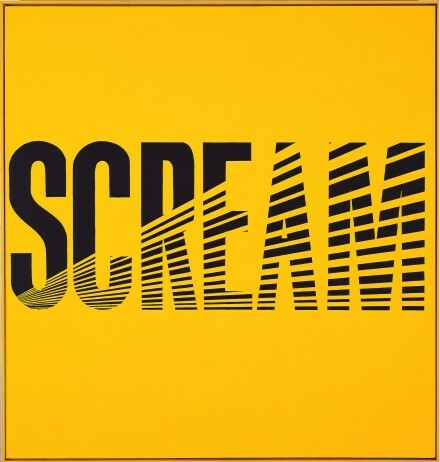 Ed Ruscha (born in 1937 in Omaha, Nebraska) grew up in Oklahoma City. He found a love for typography when worked, in his teens, as a type setter at a printing and bookbinding company. Early sources of inspiration were found in the work of Robert Frank and Man Ray. 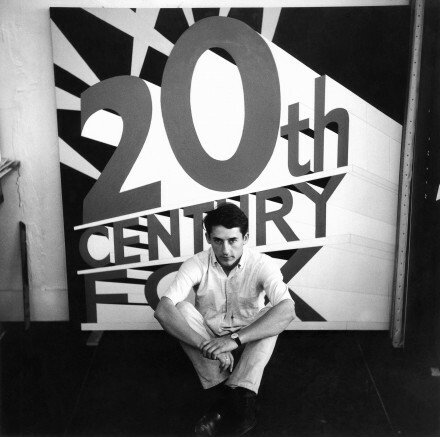 Before his twentieth birthday, Ruscha hitchhiked to Los Angeles, where he began studying art and commercial graphic design at the Chouinard Art Institute (now the California Institute of the Arts). By the time he left he had discovered the work of Marcel Duchamp, Jasper Johns, and Robert Rauschenberg. His attention had shifted to making paintings with loud, punchy, monosyllabic words such as Oof (1962) and Noise (1963), for which he is most well-known. 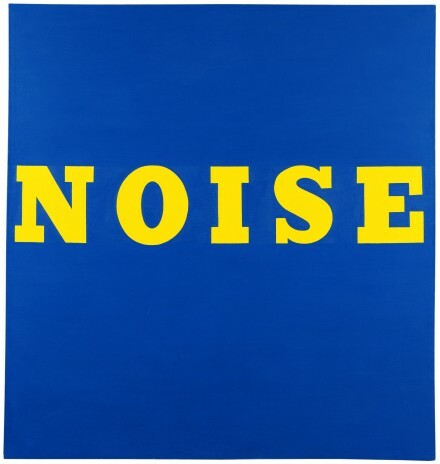 Ed Ruscha, Noise, 1963. Courtesy of Moderna Museet. From there, the artist’s paintings began taking on longer phrases and flashier backgrounds. In 1980 Ruscha developed his own typeface, named “Boy Scout Utility Modern,” which he used in many of his works thereafter. An example can be seen in 90% Angel, 10% Devil (1982) and in recent works, such as Baby Jet (1998). Ed Ruscha, 90% Angel, 10% Devil, 1982. Courtesy of Moderna Museet. 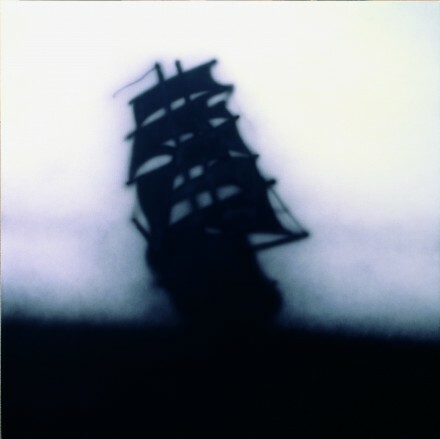 In 1986, Ruscha began a series of wordless, “strokeless” silhouette paintings. Although traditionally the artist only used oil paint on canvas, for this series he “wanted something smoky and difficult to see.” Against his own principles, Ruscha used a spray gun and acrylic paint to achieve the blurred effect. A blanked-out word or image, he felt, “can suggest to you something like a censor’s strip. Or it can suggest the opposite. It can suggest a space for thought…” But always a formalist, it is the “bang of the black and white together” that most interested him. 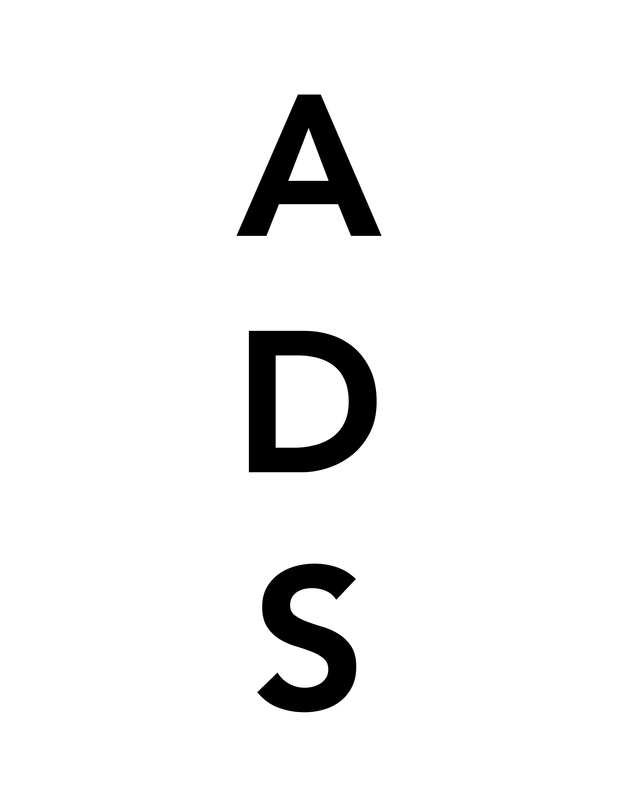 Ed Ruscha, Untitled, 1986. Photo by Paul Ruscha, courtesy of James Corcoran Gallery, Los Angeles. Ruscha’s work has seen increased interest recently when the Obama family chose his work I Think I’ll… (1983) for the White House. In 2009, Gagosian Gallery in London showed an artist’s book Ruscha created of Jack Kerouac’s legendary novel On The Road. In 2008, the Sundance Channel’s show Iconoclasts featured an episode in which Ruscha meets with Stella McCartney. The designer’s father is a collector of Ruscha’s work, and the two discuss collaborating on a fashion line. 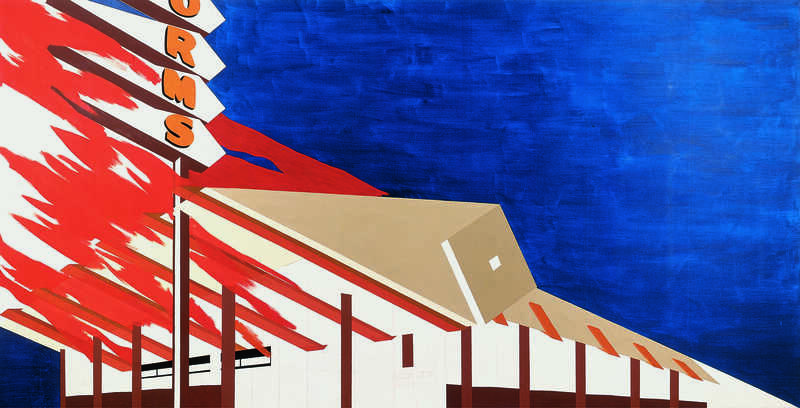 Having worked in drawing, photography, and artist books, Ruscha has proven his versatility. Yet it is to paint, his main medium, that the exhibition at the Modern Museet pays homage. Other major Ruscha retrospectives include “The Works of Edward Ruscha,” organised in 1982 by the San Francisco Museum of Modern Art and shown at the Whitney Museum in New York and other museums around the USA and Canada; “The Drawings of Ed Ruscha,” which opened in 2004 at the Whitney Museum, toured to the Museum of Contemporary Art in Los Angeles and other American institutions; and “Ed Ruscha Photographer,” 2006, shown at Jeu de Paume in Paris, Kunsthaus Zürich and Museum Ludwig in Cologne. The artist currently shows with the Gagosian Gallery in New York, Beverly Hills and London. 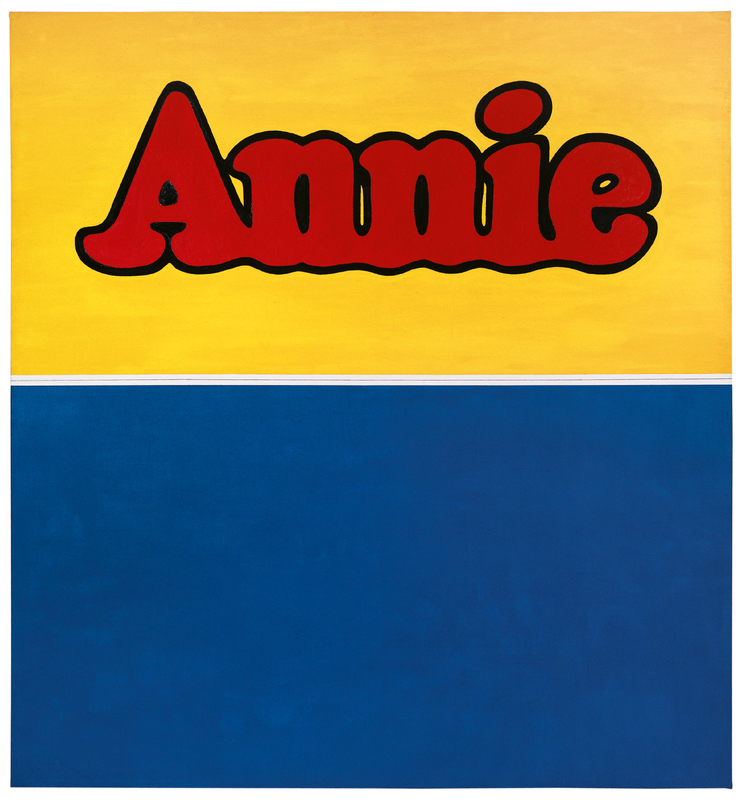 Ed Ruscha, Annie, 1962. Photo by Paul Ruscha, courtesy of Moderna Museet. Ed Ruscha, Norm’s, La Cienega, On Fire, 1964. Photo by Paul Ruscha, courtesy of Moderna Museet. 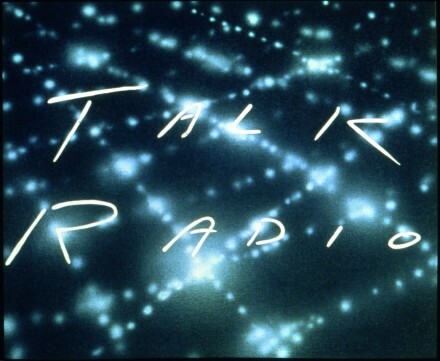 Ed Ruscha, Talk Radio, 1988. Photo by Paul Ruscha, courtesy of Moderna Museet. 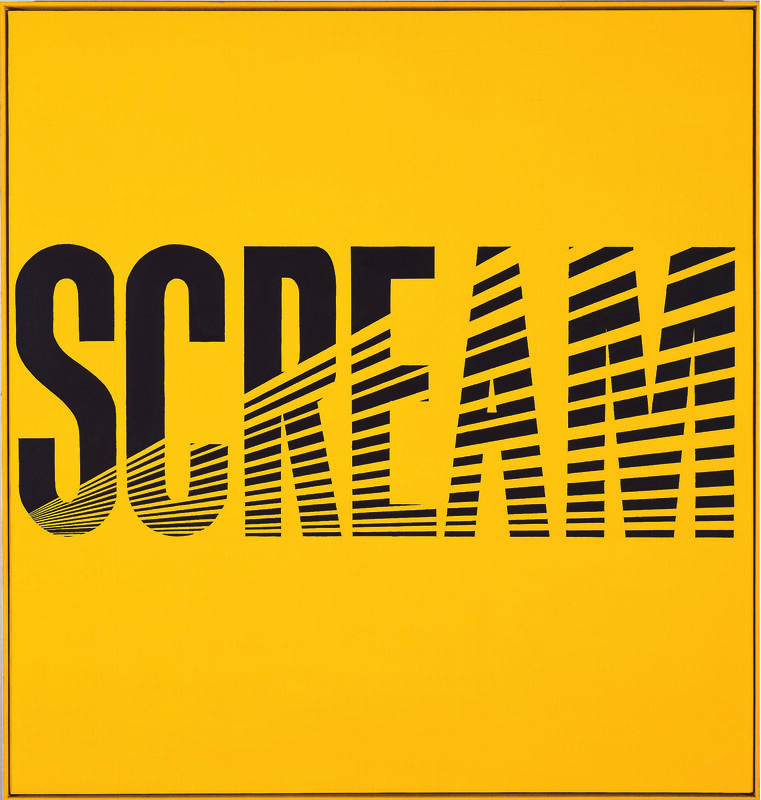 Ed Ruscha, Scream, 1964. Photo by Paul Ruscha, courtesy of Moderna Museet. Ed Ruscha, Triumph, 1994. Courtesy of Moderna Museet. 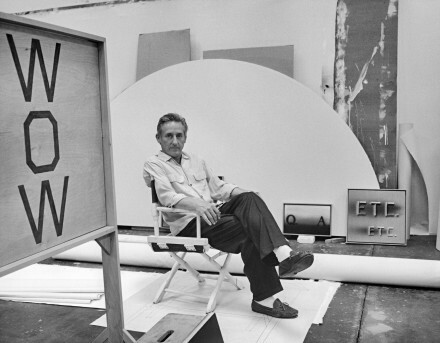 Ed Ruscha in his studio, Venice, California. Photo by Leo Holub, courtesy of Moderna Museet. This entry was posted on Thursday, September 2nd, 2010 at 9:27 am	and is filed under AO On Site, Ending September 2010. You can follow any responses to this entry through the RSS 2.0 feed. You can leave a response, or trackback from your own site. Wow! Yes, I was there too, in July 2010, and wrote a few lines about it on my blog. I wasn’t that impressed the first few minutes, but when I took time and concentrated as well as listened in, I was overwhelmed. You are right, this is an exhibition not to be missed if you are in Stockholm. Moderna Museet do do some pretty interesting shows. This is an exhibition I would have loved to see on tour. artists as revolutionaries ? ? ?